If you are a LulaRoe retailer you already understand that communication is key to making your business work. If you’re like most consultants, you may have become a retailer so you could have the freedom to work your preferred schedule from home and not be tied to a 9-5. Automate your messaging to increase sales and save time using text marketing for your LulaRoe business. Send bulk messages from your computer or use our phone app. Text message marketing has been gaining popularity over the last several years. With a 98% read rate, it’s easy to see how many businesses are using it to save time while increasing revenue. In this article, we’re going to tell you how it works, why it works, how to implement it and track the results in your business. Why would you use text messaging software when your phone already allows for you to send texts? We all understand that sending a text is a great way to get your message across and allows for the recipient to respond to the message when it’s convenient for them. But there are a few key components about text software that is different from sending texts from your phone. First, the ability to create groups: create groups for customers and team members that are separate from one another. 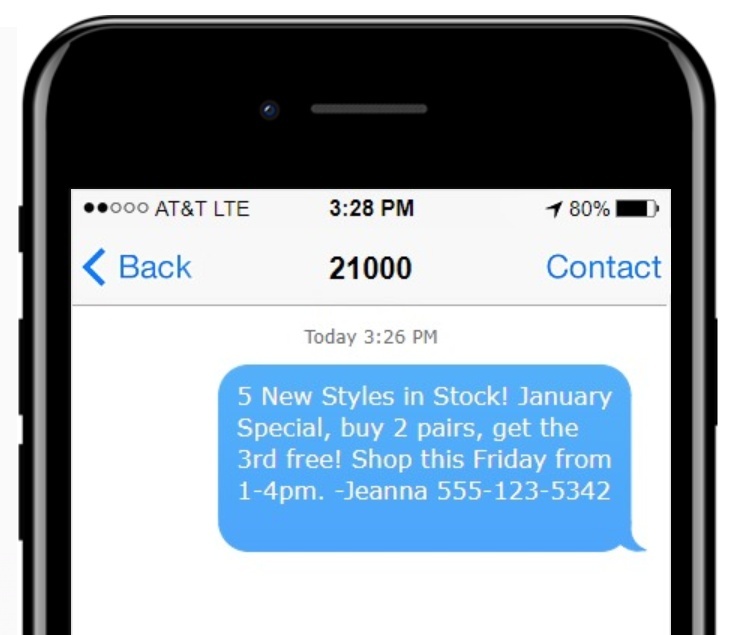 When it’s time to let customers know that you have new inventory, create one text message and select your customer’s group, press send, and your text will automatically go to all of your customers within that group. 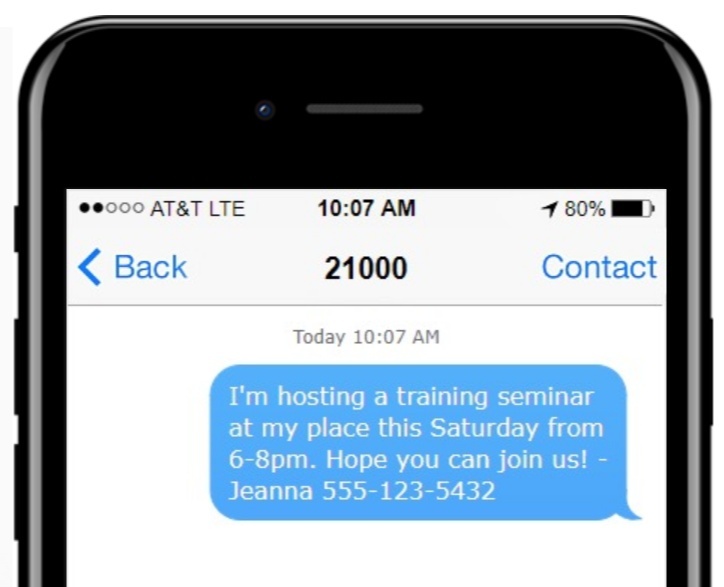 Send your team members their own message about training sessions to keep your downline engaged and on the right track. Using text message groups means no more having to go through your contacts and having to remember everyone to add to send a group invite or text. It also means that replies are one-to-one instead of all members of the group getting replies every time someone responds which can get frustrating when there are a lot of responses to a group text and can cause customers to turn off notifications for that thread or ignore the messages altogether. Send clients messages to sell inventory and inform them of upcoming events. You can schedule these out in advance or send them on demand. Text marketing can seem confusing at first but it’s actually really simple once you get started and the results are well worth the slight learning curve. 1. Create a free trial account here. You’ll have 15-days and 100 messages to test the system with no commitment or credit card required. If you’d like, our customer success managers will help you integrate your business with our system at no additional cost. This only takes 10 minutes. 2. Upon signup, you’ll be asked to choose your keyword. The keyword is the name that people will text in to join your list. A lot of LulaRoe distributors choose their first or last name. *Tip, pick a word that isn’t going to try and auto-correct or that is hard for others to spell. The following 2 steps you can complete yourself or reach out to our team and let our customer success managers walk through this with you. If you are new to text marketing, we recommend that you utilize our team since these integrations can be a little confusing in the beginning. In doing so, you’ll know that your account is set up correctly and get free expert advice from our team who have helped dozens of LulaRoe Distributors integrate SMS marketing in their businesses. 3. Decide if you’d like to have 2 different Keywords or if you want to keep your 1 chosen Keyword and create Groups. The difference between Keywords and Groups is, additional Keywords cost between $2-5 a month to have but this will allow you to own 2 words to differentiate your lists. With the use of groups, you would use your 1 Keyword Jeanna and add a group extension name. An extension could be Jeanna-team or Jeanna.team whenever this phrase is texted in, those members would be sent to your team group. You can have as many groups as you’d like at no additional cost. Whether you choose to use Keywords or Groups, we recommend one for clients and one for your team members. In this case, we’re using two Keywords, Jeanna & Team. Each Keyword gets the appropriate auto-response back as soon as someone texts in. You only have to set the auto-response up once and can change it at any time. In this case, we are using one Keyword Jeanna and the Group Jeanna-team. The uses are the same as the above, one group is for customers and the other is for the LulaRoe team. Each group still receives the appropriate auto-response that you determine. The only difference is the word that people will text in. 4. Set your auto-responders for your Keywords and/or Groups. The auto-responder is the message that people will receive automatically when they join any of your text groups as seen on the examples above. You can change the auto-response message at any time to be specific to holidays, specials, etc. *Tip, make sure your auto-responder identifies who you are. Print a couple of flyers with your opt-in instructions on it. One for your store and one for parties you host at other locations. Again, incentives work best for getting someone to opt-in. Offering 10% off your order or a small item for free can generate great results. Put your opt-in information on the back of your business cards or any other printed materials. Put it on your social media bio descriptions and make regular posts about it. Posts with incentives will get more results. Such as, “Join my text club today and receive free shipping.”. *Tip, pin the opt-in instructions to the top of your Facebook page so it gets seen more. Put a decal on your car, this way you can attract customers who may be in search of a LulaRoe Consultant. If you send emails or newsletters, put an incentive to join your list in each one. If you have a website, put instructions to join on there or use our web widget to gather opt-ins. The more opt-ins you gain, the better results you will see in your marketing efforts. 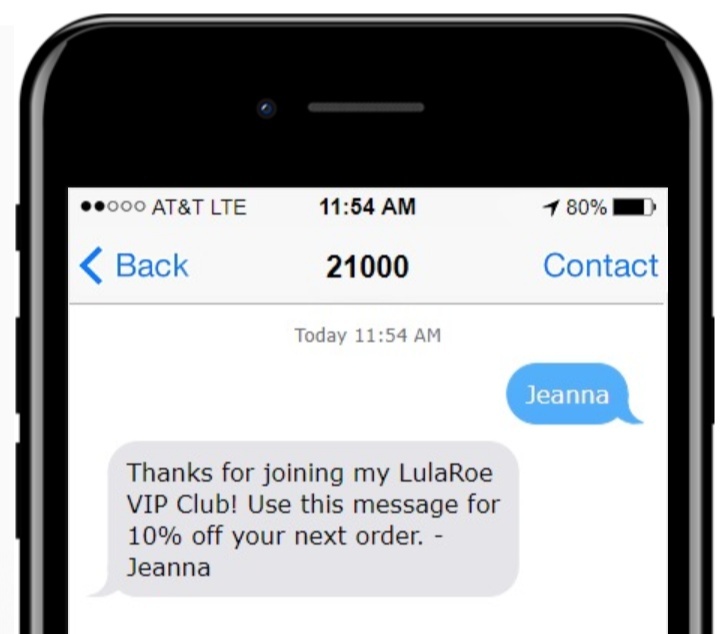 You can schedule messages in advance to save time, set-up drip campaigns, or send messages on demand, whatever works best for you in your LulaRoe business. Our team is always happy to help our customers succeed in their businesses. Sign up for a free trial to see what results you can get will text marketing. Run a contest and pick a random winner. Reward your text group members by doing an occasional contest or giveaway. You can send a text to all contacts on your list and tell them how to enter and then let the system randomly pick a number to win the prize you are giving away. This is a fun way to keep people involved and keep your name fresh in their minds so they’ll refer people to you whenever someone asks them where they got their cute leggings or other Lularoe clothing item! *Tip, for your first contest or giveaway, utilize our customer success managers to help you set the campaign up since this message will use our text to win software. Text into your customer group and offer a free skirt to the first person who will host a LulaRoe party at their home. This can be a great way to keep those parties scheduled out. Text customers weekly what hours your store will be open for that week so they know when they are welcome to come shop. This way you’ll have a set time to send all shoppers to come shop rather than having to set up individual shopping times for each customer. Get feedback from your LulaRoe customers by using our text to vote software. Ask customers which LulaRoe item is their favorite or what they’d like to see more of in your store. See the results of the vote in your TXT180 dashboard and use the information to keep what the customers want in stock. Keep your team members on the right track by sending them business tips and what is working for you in your business. Refer them to utilize text marketing by TXT180 and receive $50 or free messages & your team members will also receive free messages. There are a lot of great features when using text message marketing software that is a lot different than traditional text messaging such as text 2 win. text 2 vote, reports, and more! 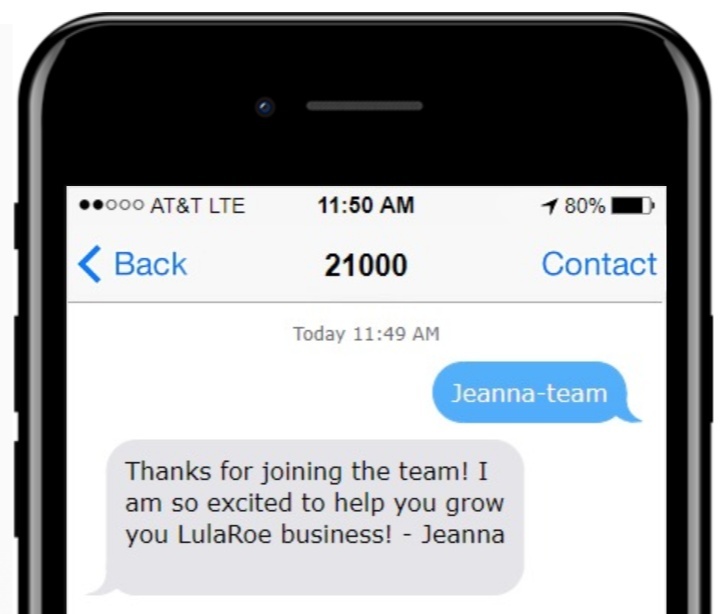 Let our team know if you have any questions on how to make text marketing work for your LulaRoe business.